The Wooting One brings a highly useful innovation to mechanical keyboards with the implementation of analog input. Not only does it work but in certain cases it enhances your gaming experience. 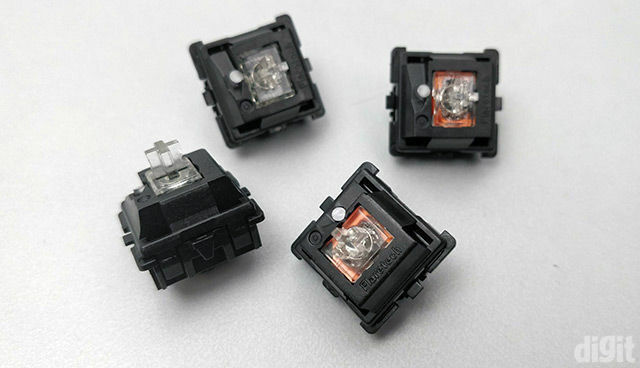 Along with the advantage of analog input, optical switches deliver an incredible durability which is double of what is offered by mechanical switches. The software offers the best experience of controlling illumination on the keyboard compared to the rest. It lacks macro recording functionality and certain other features are currently present as workarounds rather than native features. However, the Wootility software offers powerful control over the analog settings such as the variable actuation distance and customisable analog curve. This is their primary focus and they have implemented it quite well in a simple interface. Not to forget, there’s also a big learning curve to get used to analog control on a keyboard. For almost all your life, you must have been using keyboards with digital input, and because of this muscle memory, it will take some time to be familiar with analog control. The biggest shortcoming is that the keyboard will still be detected as a controller and not an analog keyboard. Since the concept of an analog keyboard is new, games don’t really have native support for these keyboards yet. The only way for it to happen is the adoption of this technology by big video game developers and studios. 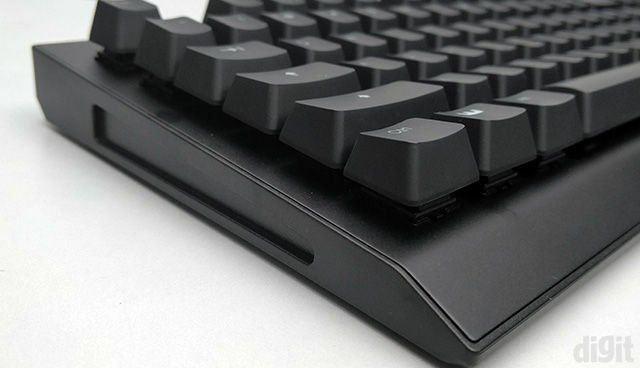 A mechanical keyboard with analog input might sound incredible for keyboard enthusiasts. However, for regular users, it doesn’t really mean anything unless they experience it first. The Wooting One can cater to both. If the analog input is taken out of the picture, the keyboard works brilliantly in the normal digital mode as well. But you shouldn’t be buying a Wooting keyboard if you aren’t going to use the analog mode. Being tenkeyless, it could be a deal-breaker for many but fret not, they are coming out with the Wooting Two. 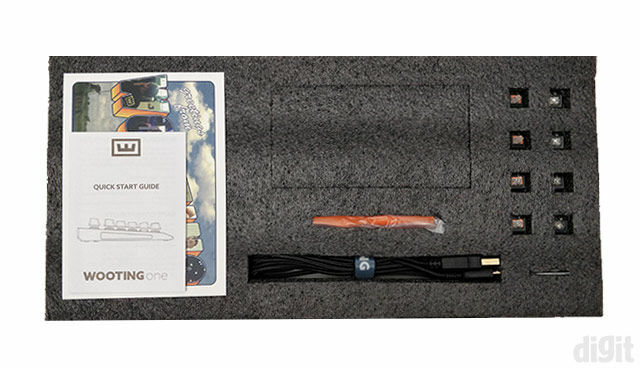 This one is going to be a standard-size keyboard with a number pad. Coming back to the Wooting One, they don’t officially sell in India yet. If you wish to buy one then you’d have to do so from their website and bear international shipping charges. Since computers have existed, keyboards have been used as input devices even before the mouse was introduced. Its journey started with the typewriter and it eventually was adopted as the favourable input device for computers. What followed was gradual innovation in keyboard and switch design. However, one thing always remained the same. The input signal type. Keyboards have been and still are using digital signals as inputs to computers. This means there are only two modes, on and off. So, either the key is pressed or it isn’t. All the major keyboard manufacturers are using digital signal as input in their keyboards. Wooting, on the other hand, had been working on bringing analog input to keyboards. And they did with the Wooting One, becoming the first to do so in mechanical keyboards. The Wooting One can communicate with the computer using both analog and digital signals. In analog mode, it becomes possible to accept more than just an on and off signal. This means you can send more data through a single key press. 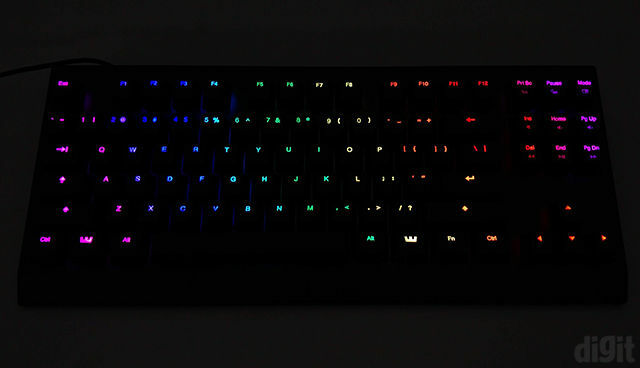 It’s possible due to the usage of Flaretech optical switches in the keyboard. They are still mechanical switches, but the key registers using optics. With these optical switches, the varying intensity of light is translated into varying signals. The input signals vary according to the distance of the key press. In gaming controllers, the analog stick’s input is based on how far you push it away from the centre. This is exactly how the Wooting keyboards work. We say keyboards because they have the Wooting Two (standard-size) coming soon as well. With analog control, the keyboard can be detected as a controller using Xinput which is used by modern controllers (except Playstation) to communicate with your computer. This brings a paradigm shift in playing games with the keyboard. There are many more things the Wooting One provides using analog control that we will be exploring in this review. Broadly, the Wooting One stands out from other keyboards with the novel concept of analog control. Due to this single feature, the keyboard opens itself up to numerous possibilities for features that can be implemented in the future. And most of them can be done with just a software and firmware update. So far, many incredible features have already been implemented that we will be talking about in this review. While we speak, more features are being added in a healthy and collaborative developmental cycle with feedback from the community. There aren’t any passthrough ports for USB or audio. Any keyboard above 10k or calling itself a gaming keyboard must implement more than 6-key rollover. 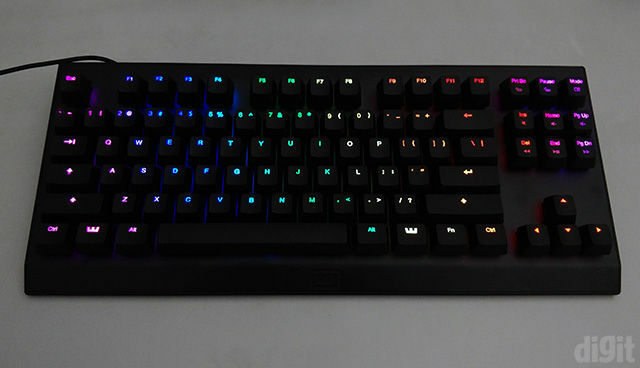 You will usually find keyboards with 6 or 10-key rollover in gaming keyboards which is enough. Although you might not be able to press more than 10 keys at once, it’s nice to have an upper breathing room. The Wooting One comes with full N-key rollover and it will register all the key presses without any problem. Multimedia functionality can be controlled using modifier keys and you can also control the brightness levels. A dedicated Mode key can be used to switch between digital and analog modes. The arrow keys (left, down and right) along with the Fn key can be used to switch between the three analog modes. All the analog functionality is possible because of the usage of optical switches. Manufactured by Adomax, Flaretech optical switches have been used in the Wooting One with some modifications. There are two variants of the Flaretech switches including Linear55 “Red” and Clicky55 “Blue”. The Red switch is actually clear while the Blue switch has Orange on the inside. Our variant had the Linear55 “Red” switches. 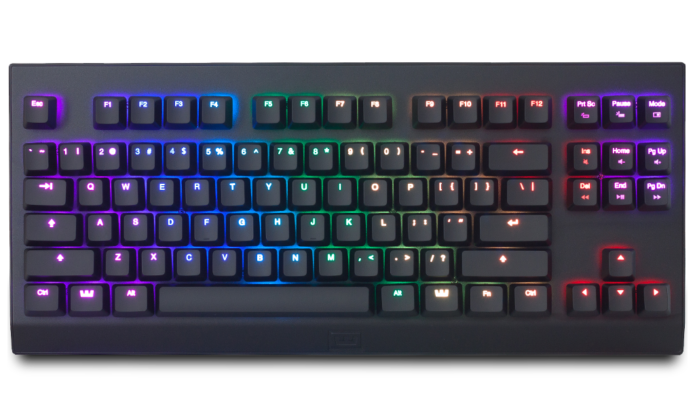 Both the switches have an operating force of 55g and a lifespan of 100 million keystrokes, twice the amount of Cherry MX mechanical switches. Being optical switches, there’s no requirement for electrical contact for the keystrokes to be registered. Infrared light is emitted from the LEDs which falls on the lenses inside the switch. A prism-like lens inside the switch, on the stem, reflects back the light to the photosensor on the PCB. Based on the intensity of the light received, the input varies, resulting in a maximum of 255 values possible across a single key press. This is an oversimplification since there’s a lot happening inside the switch. The switches don’t have to be soldered to the PCB. 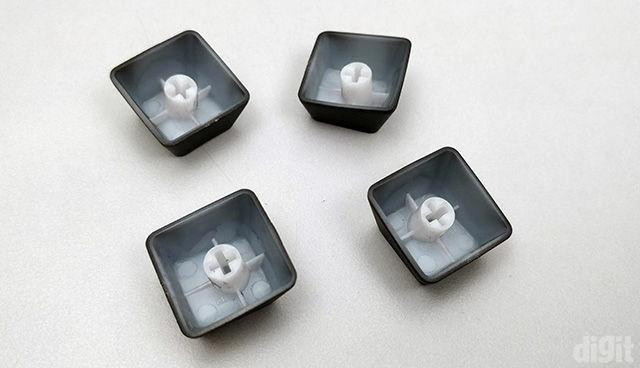 This means that the optical switches can be removed by simply pulling them out, making them hot-swappable. If any of the switches get damaged or stop working in the future, they can be easily swapped without having to desolder and solder new switches. Another advantage is no more keyboard chatter because of the absence of any corrosive contact points. Otherwise, in mechanical switches, double or more keystrokes are registered from single key presses as they start wearing out inside. Due to optical switches, the input will be literally travelling at the speed of light without having to wait for a mechanical component for instructions. It will drastically lower the debounce time compared to mechanical switches and further lower the input latency. For cable management, a velcro strap is provided. Further, there are three cable routes below the keyboard. These routes will allow you to route the connected cable using either the extreme right or extreme left or the middle groove. 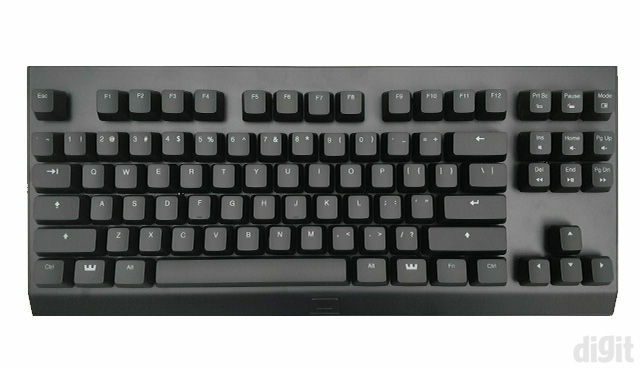 There are four rubber pads at the bottom of the keyboard. Two extendable feet are attached at the top to give the keyboard some elevation. They are lined with rubber to prevent the keyboard from slipping on a surface while typing. The Wooting One comes with several accessories in the box. 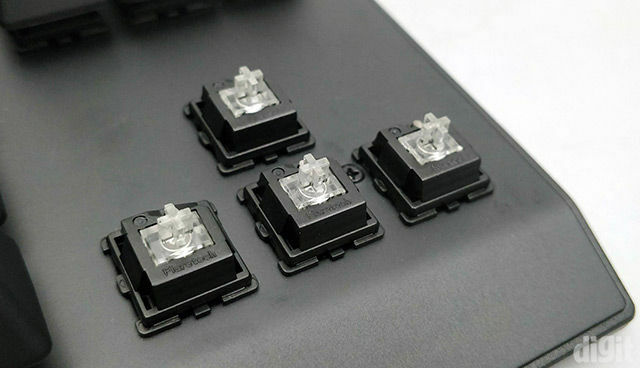 Apart from the quick start guide, you get extra switches, screws and a keycap/switch puller. Packing extra switches is a great offering. Eight Flaretech switches are provided where four of them are the Linear55 “Red” switches while the rest are Clicky55 “Blue”. Due to the hot-swappable nature of the switches, you can swap out any switch later if it stops working. However, considering the lifespan of these switches, it’s unlikely to happen. 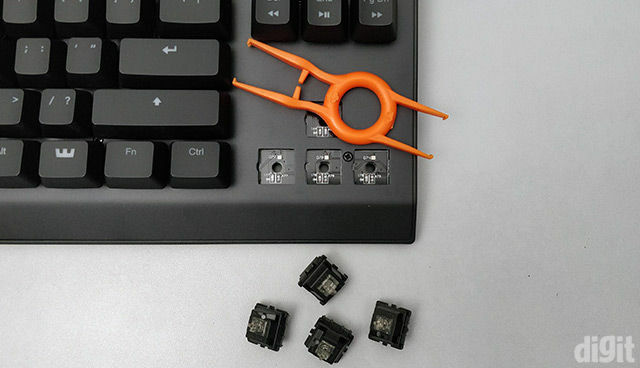 The keycap and switch puller can be used to remove both the keycaps and the switches. Even though you can pull out the keycaps using just your fingers (not advisable), you might damage the switches if you try the same. 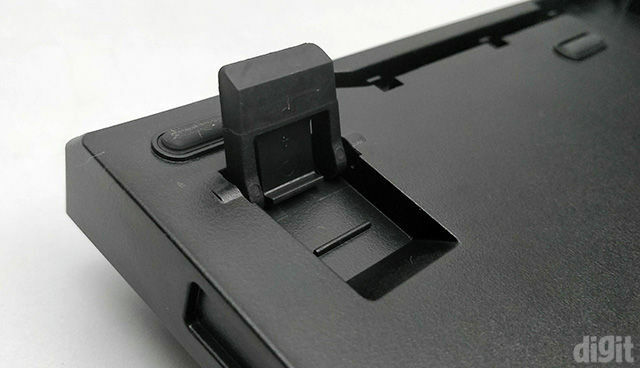 The switch puller side (appropriately labelled) will clip to the tabs on the switch and it can be easily removed. Wooting doesn’t package a wrist rest with the keyboard. All the analog sorcery partly happens because of the optical switches. The rest comes from the software. It enables you to control the various aspects of analog input coming from every key press. The user-interface of Wootility is absolutely brilliant. 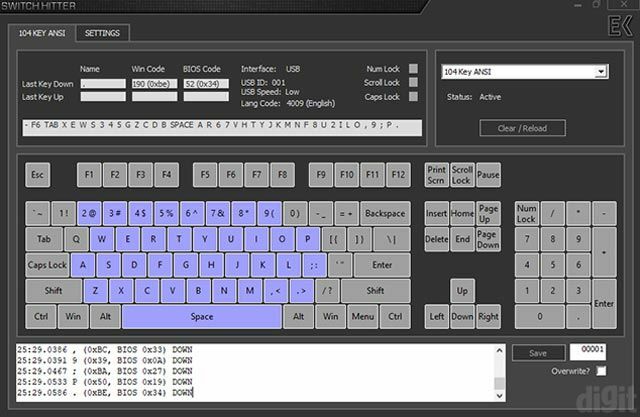 We can even go on to say that the lighting control is by far the simplest we’ve seen on any keyboard utility software from other manufacturers. 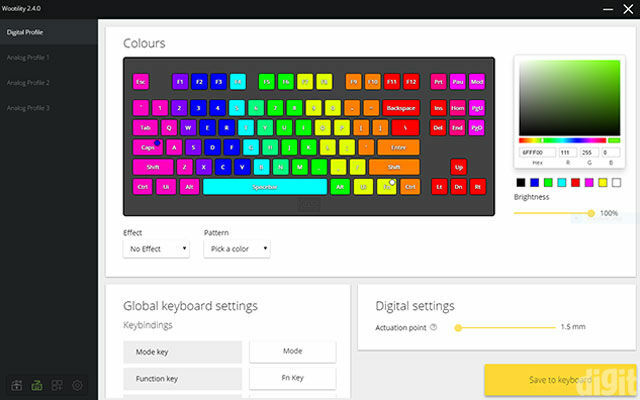 You can change the colour of the keys by selecting them and picking the favourable colour from the colour palette. Once selected, you can simply go on left-clicking the keys you want to have the same colour. Right-clicking any key will pick of the colour of that key and you can use it to continue assigning the colour to other keys. With a colour selected, you can also left-click and drag the mouse pointer over the keys to enable the same colour on them. Although the utility software definitely wins over the lighting control functionality, it falls short in other aspects generally offered by other software. There’s no macro recording functionality in the keyboard. As it’s catered towards gamers, we expected macro recording to be a feature. Other features such as a key remapping and disabling keys have been implemented in a different way which seems like a workaround for now. Although these are minor misses, we hope to see them in a future update as straight-forward checkboxes. Moving on from the expected features, we move towards the unique ones offered by Wootility. For input type in the analog mode, you can choose between Xinput and Directinput. If you’re playing new games, you’ll be selecting Xinput. Directput is more of a legacy input API that is hardly used in current games. 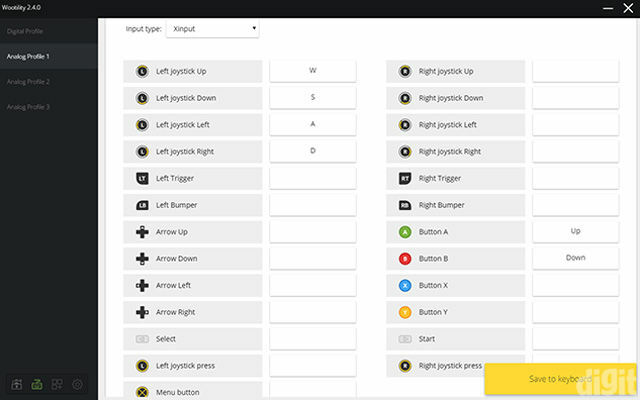 Next, you’ll find all the buttons listed from a controller that can be assigned keyboard functions. To assign a button with a keyboard function, left click on one and press the desired key. If you want to remove the assigned function, right click on it. Whatever you assign here will be reflected in the game. Below that you will find Digital settings. 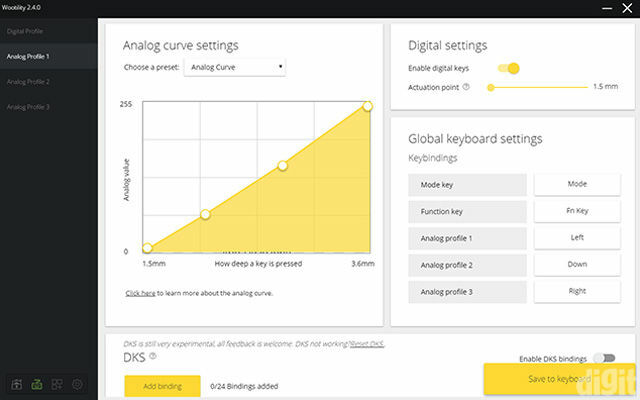 When you’re in the analog mode, you can enable or disable digital keys. Disabling digital keys will disable all the keys that haven’t been mapped to the gamepad keybindings. This also means you won’t be able to type if you Alt + Tab from the game. You’ll also find a slider for actuation point. The actuation point is the distance at which the key registers a key press. It usually tends to be around the middle of the total key travel which is not more than 4mm on most mechanical switches. On the Wooting One, you can change the actuation point between 1.5mm to 3.6mm. This level of customisation gives the user more freedom for different use-cases on the same keyboard. In games, you would usually prefer a short actuation point. When you’re typing, you might be comfortable with something more than that. You can change the actuation point in the software using the slider. You should note that variable actuation point only works in the digital mode. In the analog mode, the key is activated at the highest point. If you want to control the starting point then you will have to change the anti-deadzone’s starting point in the analog curve settings. Speaking of the analog curve, this is where you will be spending most of your time to set optimal control in games. The curve determines how the input values will change according to the distance travelled during a key press. Looking at the curve, it shows that the keyboard starts registering from 1.5mm up to 3.6mm. Anything below or above that point is called the anti-deadzone. There are four points in the curve that can be moved in the graph of analog value versus key press depth. You can increase the starting and the ending point to whatever you like between 1.5mm and 3.6mm. If you don’t want to mess your head with manually setting the curve, you can opt for the presets. 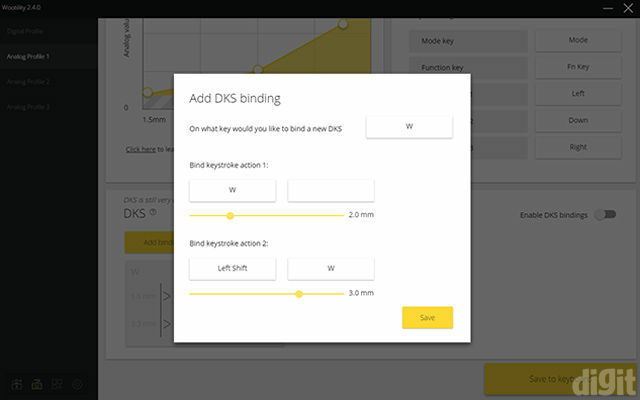 DKS or double keystroke is an experimental feature in the software in the analog mode. It enables you to assign two different keystrokes to a single key at different depths. Key combinations can also be assigned at different depths. This feature can be useful in games that don’t support analog input. DKS will be able to emulate a similar effect. For example, in PUBG you can assign both normal movements and sprint to the same key instead of pressing Shift along with W. Based on the depth assigned for the first and second keystroke, your movement will change from normal to sprinting. Similarly, this feature can be used on other games if you wish to assign a completely different function or a set of two different functions at varying depths to a single key. The DKS feature can also be used to disable certain keys. If you want to disable the Windows key then simply add the Windows key for binding and leave the rest of the fields blank. The keyboard will interpret this as sending blank instructions when the Windows key is pressed. You can do the same with other keys or key combinations. Since you can change the actuation point in the digital mode, we believe enabling this feature in digital mode should be possible as well. Currently, it’s only present in the analog mode. All these settings can be saved and then uploaded to the keyboard in three profiles. Although you can’t save more than three profiles on the keyboard, the software allows you to create an infinite number of profiles and save them locally. Once saved, it will populate under the Profile manager tab. Whenever you wish to use any of the saved profiles, you can simply click on the Load button on them, select the settings you want to load and finally select one of the three profiles to be overwritten. It’s that easy. What if you want to share your settings with someone? It’s simple. Click on the share button and it will generate a profile code which is an encrypted string of characters. Other users can simply copy and paste that code in the Import profile code tab on their end and import the settings to their keyboard. It would have been great if Wootility offered a profile explorer right inside the software. For now, you can check out this website to find profile codes of various popular games. 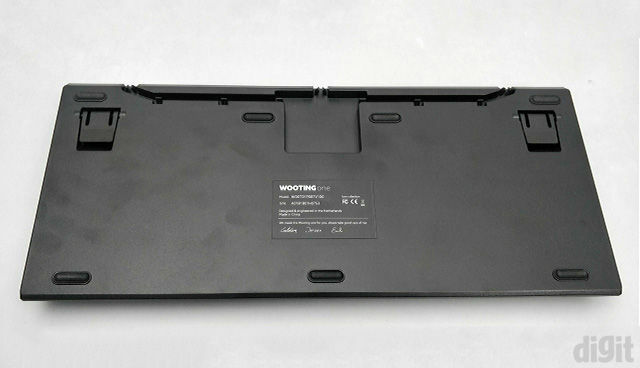 The aluminium top plate sits on an ABS plastic chassis on the Wooting One. It follows the floating key design which definitely looks good while being easier to clean. We did notice some flex on the keyboard but there wasn’t any creaking on the chassis. Since the keyboard uses aluminium as the top plate instead of steel, it’s lightweight. The Wooting One uses regular ABS plastic for their keycaps. They have a matte finish and the legends are laser-etched. What we didn’t like was how wobbly the keycaps were. If you have heavy typing usage, you might find it displeasing when you’re smashing out words. However, we were happy that the wobbly nature didn’t lead to the keycaps becoming loose after some typing and eventually coming off. Since the Flaretech switches have Cherry MX compatible stems, you can opt for aftermarket keycaps later. Wooting went with a neutral font rather than an overwhelming gamer aesthetic. This fits with the overall minimalistic design of the keyboard’s chassis. 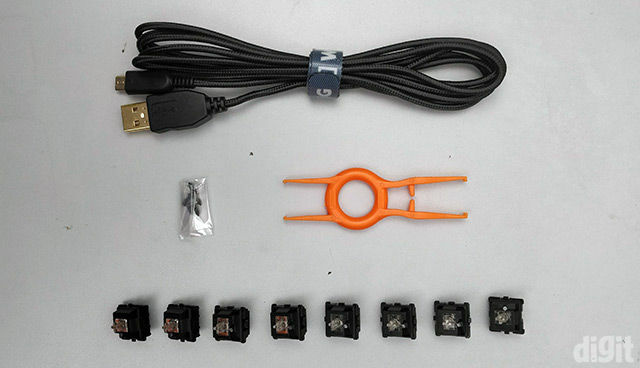 As already mentioned, the Flaretech optical switches have a lifespan of 100 million keystrokes. This incredible lifespan is possible because the switches aren’t using regular contact points as used on mechanical switches that tend to corrode over time. Since these are optical switches, the lifespan is majorly dependent on the rated working hours of the infrared LEDs used on the PCB. We say “on the PCB” because the array of IR LEDs are soldered on the PCB and the switches are positioned above them. The Wooting One uses a detachable braided cable and it connects to the keyboard using a micro-USB port. On the other end, the USB connector is gold-plated which ensures higher durability. We spent the majority of our time testing the keyboard with the recommended games that support controllers or analog input. Before jumping into the tests, we verified the key rollover in the keyboard. To determine the key rollover, we use Switch Hitter. We observed all our keystrokes getting registered on the Wooting One. Ensuring it was persistent in both the modes, we checked the key rollover in the analog mode as well. Similar results were observed. This indicates that all your multiple analog inputs will be registered by the keyboard. In analog mode, the Wooting One should be able to work with any game that supports controllers through the Xinput or Directinput APIs. So, when you’re connecting the keyboard in the analog mode, it will be detected by the game as an Xbox 360 controller. 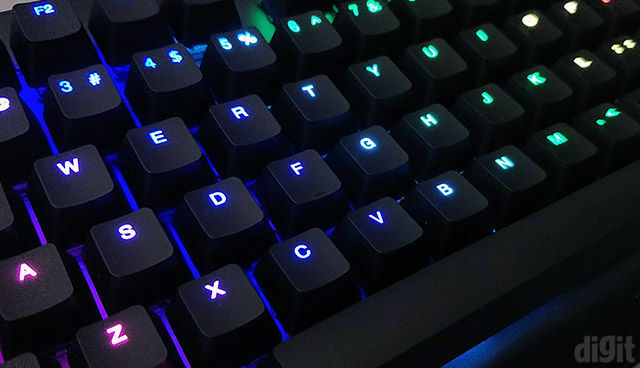 We primarily put the keyboard to test in CS:GO, Need for Speed: Most Wanted 2012, and Rocket League. In CS:GO, you will be able to control the movement using analog input. By default, when you’re moving, you’re always running in CS:GO. To walk you have to press Shift when you move. With analog input, you can do both with just the WASD keys based on how far you’re pressing the key. Essentially, as you go on pressing the key, your movement speed will increase. It will take some time to get used to this since most of the time you’ll be trying to figure out the exact point through the keypress where you start running. This is where the customisable analog curve comes in handy. Based on your play style, you can edit the curve by trial and error to reach the most suitable setting. The presets are a good starting point. What we liked about Wootility was saving these tiny tweaks were instantaneous rather than having to wait for a few seconds for all the new instructions to be uploaded to the keyboard. It’s the same case with other games as well. In racing games where you need to accelerate a vehicle, you’ll have to play around to find the favourable starting point of acceleration in the curve. You’d have to spend more time on setting up the initial anti-dead zone, so that the key press and acceleration match in the game. All of the tweaking has to be done separately for every game you play unless the publically available profile code is suitable for you. And only as an enthusiast will you find this process amusing. If you’re looking for a well-built ecosystem where you’ll find the presets of most of the popular games readily available, you won’t get that here easily. Not yet. You might also come across limitations on a few shooting games that don’t support a controller and mouse simultaneously. You will be able to move but you won’t be able to aim with your mouse. However, there are several popular games where the Wooting One can provide you with a great experience. Typing experience is always subjective. Some prefer linear switches whereas others like tactile ones. 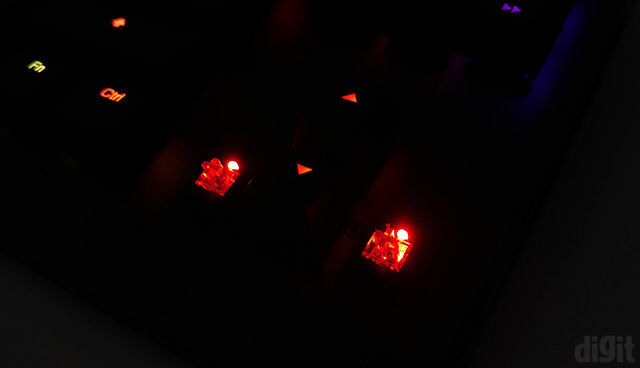 Compared to Cherry MX linear switches like the Red, the Flaretech Linear55 “Red” is louder. Hence, while typing fast, the keyboard sounded loud. 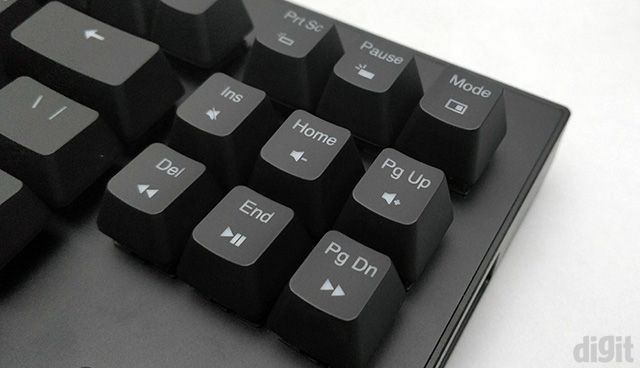 Add the noise of the wobbly keycaps and it can get irritating if you’re sensitive to keyboard noise. We tried swapping the keycaps to determine who was responsible for the noise and found the switches themselves to be the culprit. Apart from that, we didn’t face any problems while typing and it took us a few days to get used to it. It follows a standard or OEM profile for the keys.